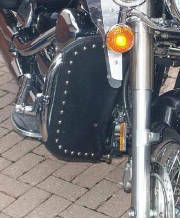 We are now proud to offer high quality Engine Guard Chaps. The chaps are made from Heavy duty vinyl for long lasting durabilty. They look and feel like leather. These install quickly with snaps and buckles - you wont find cheap velcro on these. As with all our products, they are also covered by our 100% no hassle return policy. If your not happy with the quality - return them for a full refund. Embroidery will appear on both sides mirror imaged. 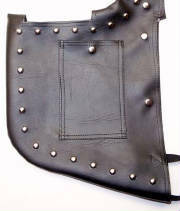 Designs are limited to 6000 stitch count, please contact us first if you would like a design with a higher stitch count.